There is an inherent beauty to the old farm machinery used by so many generations. There is something about the sight of an old rusty hay rake sitting in an open field, or a long abandoned mowing machine with honeysuckle growing up the cutter bar, that just begs to be photographed and framed. It is a reminder of days long gone, a time when agriculture dominated the economy, and whole families made their living from the fertile land. But there was so much more to these wonderful machines. As a child, I was always fascinated by the integrate mesh of gears, and chains, and blades, that were combined to form something that looked like it belonged in a Jules Verne novel. Surely if you combined these machine with some mysterious power you would materialize in some other time or dimension. As with so many children of the farm, the first time being behind the wheel of any vehicle was in the seat of my grandfather's Super A Farmall tractor. As there are loyalties in the automotive world, i.e. Ford, Chevy, Dodge ... there was also loyalty amongst the farming community. There were green farmers, and blue farmers, but we were always red farmers. International Harvester was our equipment of choice. International Harvester Company, was formed August 12, 1902, by the merger of the McCormick Harvesting Machine Company, Deering Harvester Company, Milwaukee Harvester Company, Plano Harvester Company, and Warder, Bushnell & Glessner Company. Cyrus H. McCormick Jr. was named president of the board, while Charles Deering was named the chairman. 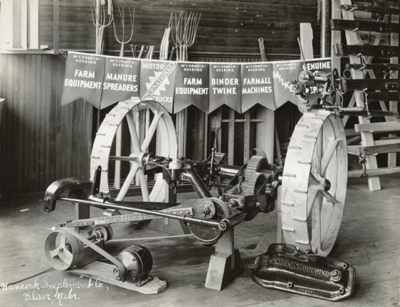 In 1911, the company began producing implements such as mowers, rakes and fertilizer spreaders under the McCormick name. 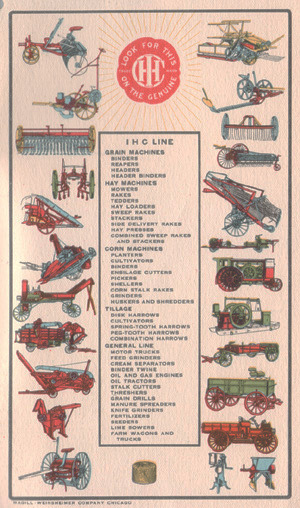 The McCormick-Deering line of mowers included the No. 6 Plain Mower, No. 6 Vertical Lift Mower and Big 6 Mower. 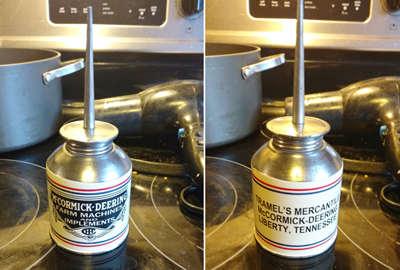 In following years, the company produced the McCormick-Deering No. 6 Plain Lift Mower. 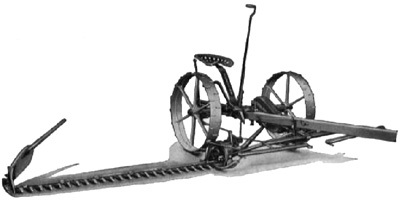 Horse-drawn mowers were generally designed with a series of gears that would power a mower bar. As the wheels turned, they would turn several gears which would turn a flywheel. 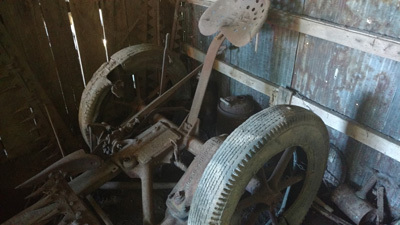 The flywheel would move a wooden pitman arm back and forth, which was connected to the mower bar. 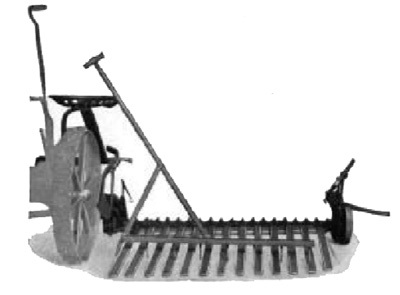 The mower bar consisted of a set of knives or blades, that would move back and forth between a set of guards. The guards, fitted with serrated plates known as ledger plates, would act in a scissor action with the knives, cutting grass and other foliage. In 1929 the company introduced an improvement in the horse-drawn mowers with the No. 7 Regular Lift, No. 7 Vertical Lift, and Big 7 Regular Lift. The No. 7 was the first enclosed gear mower, which meant the gears were housed in a gear box with a bath of oil continuingly lubricating the works. Think of a differential or rear end under a truck or car. Before the No. 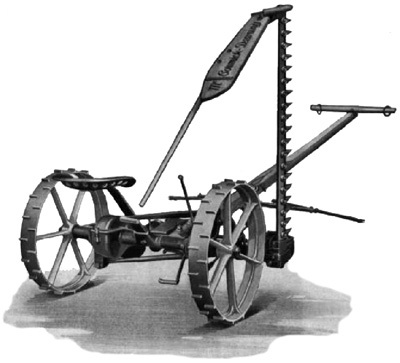 7, mowers were an open gear design, meaning the user would constantly have to stop and manually oil the drive gears on the inner wheels. The main axle is made in two sections (one long and one short shaft) with the pawl-and-ratchet devices placed at the junction of the two sections inside the gear case, similar to the differential arrangement on an automobile. Placing the pawls and ratchets in this location protects them from dust and undue wear and assures proper lubrication at all times. The axle revolves in four roller bearings (two single and two double) which are encased in steel sleeves that can be replaced when worn. The bearings are automatically oiled from the gear case and require no attention. Leather oil seals enclosed in metal cases prevent oil from leaking past the ends of the axle. The mower wheels are keyed solidly to the axle sections, eliminating end play, wobble, and lost motion. The Plain Lift Regular No. 7 and Combination Regular No. 7 (which could be converted to a plain lift or vertical lift cutter bar) came with the option of two bar sizes, a 4-1/2 foot and a 5-foot mower bar, while the Plain Lift Big 7 offered bar sizes from 4-1/2 to 7-foot. The Combination Big 7 had bar sizes of 4-1/2 and 5-foot. The weight of the Regular No. 7 ranged between 770-780 pounds, depending on bar size, while the Big 7 weighed between 835 and 860 pounds. The Combination No. 7 weighed between 780 and 790 pounds, while the Combination Big 7 weighed between 845-850 pounds. Big 7 mowers have heavier and wider rim wheels than the Regular No. 7. Pneumatic-tired wheels could also be obtained at extra cost for any size of No. 7. The vertical-lift mowers possess the feature of having both vertical and plain lift and can be changed instantly from one to the other by merely shifting a lever. The plain-lift mowers do not have this combination-lift feature. Vertical-lift mowers permit raising the cutter bar to a full vertical position without stopping the mower or leaving the seat. This mower has a high horizontal lift for passing over trash and stones and a full vertical lift that swings the bar out of the way of high obstructions. Either type of lift is instantly available by merely moving a small lever. Heavy-Duty Bar - This bar was substantially constructed for heavy work and cutting over rough, stony ground. It had heavy-type guards and was supplied with heavy knives. Guards have the same spacing as on regular mower bar, but are larger and heavier and make continuous contact at the base. Weed Bar - This bar was designed for cutting heavy weeds, light brush, etc. It had heavy, blunt guards that have no lips. This feature permits cutting woody stems and stalks with less draft and likelihood of choking. A heavy knife was supplied. Lespedeza Bar - A low-cut bar with steel double guards of special type having 1-1/2-inch spacing. Designed especially for cutting Lespedeza and other crops where an extremely low cut is desired. Steel guards have no ledger plates. Knife with under-serrated sections were supplied. 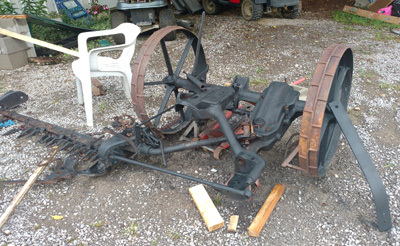 Reaper Attachment - A reaping attachment for cutting grain and special seed crops could be supplied for use with all McCormick-Deering mowers having 4-1/2 and 5-foot cutter bars. 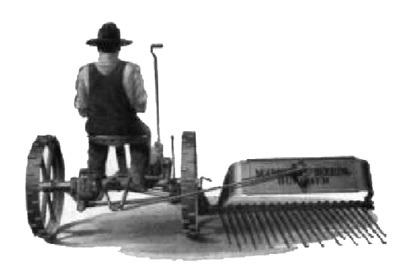 The attachment included an extra seat over the right wheel for the operator, who reels the crop onto the platform with a rake and retains it until a gavel of the right size is secured, then dumps it off upon the ground. 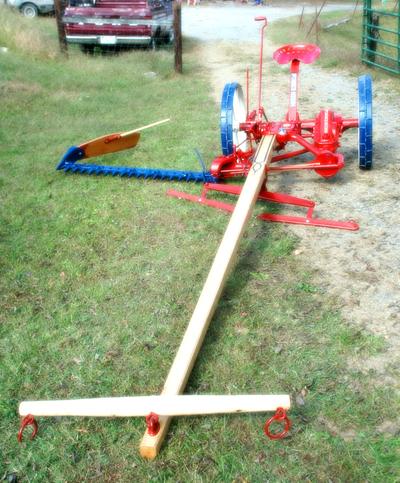 Buncher Attachment - This attachment was designed for gathering very short hay, which could not be raked easily. 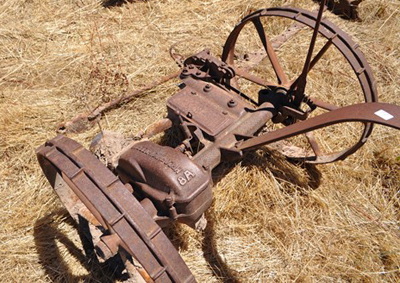 It was used also for gathering seed crops. The hay is gathered upon the slatted platform back of the cutter bar, and when a sufficient amount has accumulated, the driver dumps it by raising the shield. This was accomplished with a foot lever. Buncher attachments could be furnished for 4-1/2, 5 and 6-foot mowers. Mower Tongue Truck - Under certain conditions owners sometimes preferred to equip their mowers with a tongue truck. The tongue truck reduces side draft and takes the neck weight off the horses. The truck was provided with a casting permitting the attachment of a draft rod running from the inner shoe hinge on the cutter bar to the tongue truck. The tongue truck could be supplied with a long pole and stub pole, or could be supplied without either pole when so ordered. 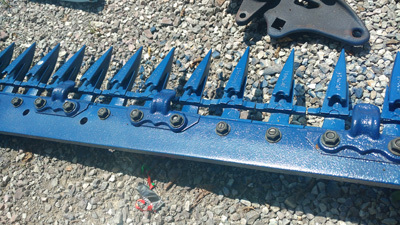 Vine Lifters - Used when cutting matted grass, vines, etc., also on binders for lifting lodged grain. The lifters fit over the guards and are bolted individually in place. Upper bar vibrates and clears itself of vines. 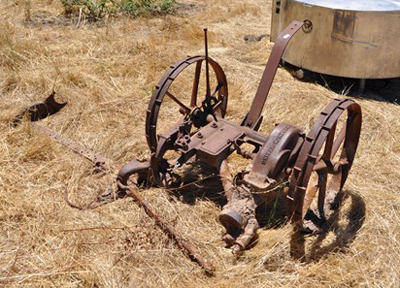 Weed Attachment - McCormick-Deering mowers could be equipped with a weed attachment which holds the cutter bar off the ground at a sufficient height to avoid stones or to pass over a young crop of grain. The attachment consists of an adjustable hook which supports the inner end of the cutter bar and a wheel for supporting the outer end of the cutter bar above the ground. Both ends are adjustable so that the cutter bar can be raised to any height up to 12 inches. Canning Pea Mower Bar Attachment - This bar is made especially for harvesting green peas for canning. The bar is regularly equipped with pea vine lifters (set of six), pea vine divider, and windrower fingers. The pea vine lifters are of special design, smoothly finished, and streamlined to give the most efficient action. The lifters are hinged so that the points follow the contour of the ground closely, picking up all the vines and raising the pods above the sickle so that none will be cut or wasted. The windrower is designed so that the vines are rolled gently into windrows, with the pods inside and the vines and stems on the outside. This prevents the pods from drying out and keeps the peas fresh. The windrow is deposited at the rear, out of the way of the horses or tractor wheels on the following round. No. 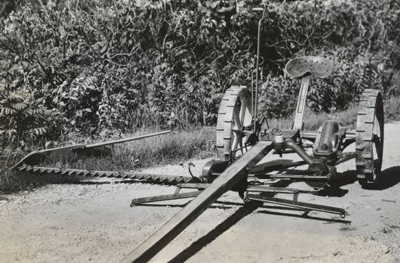 7 Pneumatic-Tired Mower - For cutting weeds and grass along the shoulders of hard-surfaced roads, the No. 7 mower could be equipped with pneumatic-tired wheels for highway use. Pneumatic tires provided efficient traction on paved or hard-surfaced roads and made a comfortably riding machine for the operator. The tires are balloon type, 5.25 x 21-inch size, mounted on conventional automobile-type rims which fit over the wheel spokes and are secured by locking lugs. This makes removal of the tire as simple as the removal of an automobile tire. The wheels have special split type hubs and are clamped tightly around the axle by four bolts. In addition, the wheels are keyed to the axle, eliminating all likelihood of wobble and end play. The No. 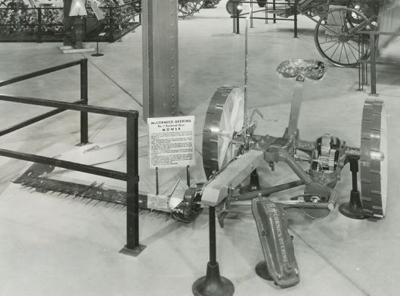 7 pneumatic-tired mower was available in 4-1/2, 5, 6, and 7-foot sizes. The equipment was same as for the standard No. 7 mower. Weight, deduct 90 lb. In 1939, the company improved the design again with the No. 9 mower. This design moved the gear box back a bit, giving the machine better balance and reducing the pole (tongue) weight. 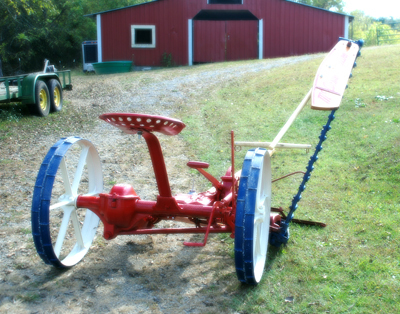 This design would last until the end of horse drawn mower production. The last year for the No. 9 mower was 1951. Was There a No. 8 Mower? While production reports from McCormick-Deering do not list a No. 8 mower, apparently they do exist. I have found no documentation about a No. 8 mower, however I have seen several post and photos of No. 8s. They were very similar to a No. 7 mower, but what looks like a casting over the gear cover to allow for a larger gear. There is also no casting for the oil can holder. According to some sources, the No. 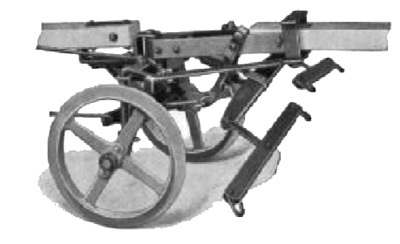 8A was an export model out of McCormick-Deering's German site, at Neuss on the Rhine, near Dusseldorf. 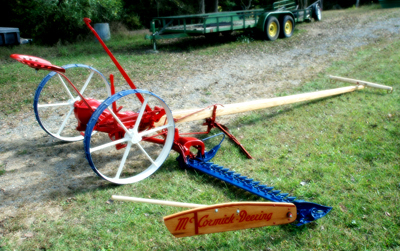 Production of implements under the McCormick brand name started there in 1911 with the typical products being, mowers, rakes and fertilizer distributors. By the time the Nazis came into power, high taxes and tariffs on imports made it difficult for companies outside of Germany to make a profit. The company was also forbidden from exporting their German marks, so in 1936 McCormick-Deering dropped farm implements at the Neuss factory and began making the more profitable tractors full time. Another thing that may have contributed to the lack of information about the No. 8 mower is the fact that 70 percent of the McCormick-Deering factory in Germany was destroyed by Allied bombing during WWII. For anyone with additional information on these, it would be appreciated if you would share your knowledge. 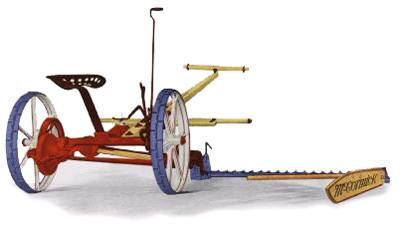 Mowers seemed to have a varying color scheme early on, with the general rule that the main body be red, the cutter bar blue, and the wheels white (or more specifically cream). Seats and springs may have been painted red or blue, while some connecting bars may have been red or white. 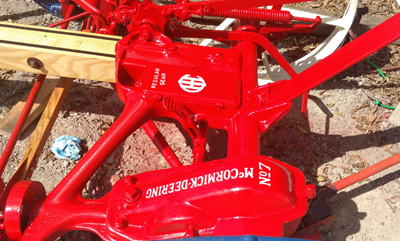 In 1927, a Paint Committee was formed by the company to create a standardized color scheme for different equipment, which would effect the McCormick No. 6 Mower - 1916-1933, the McCormick-Deering No. 7 Mower - 1929-1939, and the McCormick-Deering No. 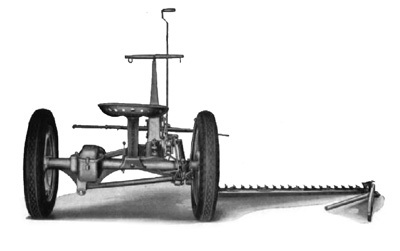 9 Mower - 1939-1951. While the committee was formed between the No. 6's production years, these mowers could have varying color schemes depending on when the mower was made. The correct colors for a No. 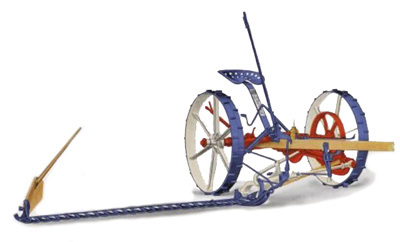 7 mower would be an oil based Harvester Red on the main body and all levers, seat, and seat spring, while the mower bar, guards, and outer wheels are a blue enamel. The inner wheels should be Harvester White (which is actually a cream or almond color), while the pole (tongue), evener, and tracker (grass board) is ochre (a burnt orange color). The tracker rod (the rod extending from the grass board) is a natural finish, while the pitman rod should be boiled in oil. All ironworks attached to the pole and evener should be Indian Red. The wrench that comes with the mower should be blue, while the oil can should be white with the McCormick-Deering logo, bordered with red and blue stripes at the top and bottom. 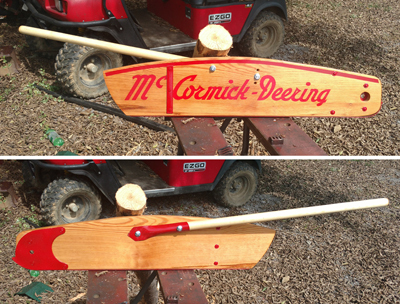 Lettering on the tracker should say "McCormick-Deering" in Indian Red, with a red strip running along the top. The pole should also have decorative striping in black running from each side and crossing across the top just past the doubletrees. 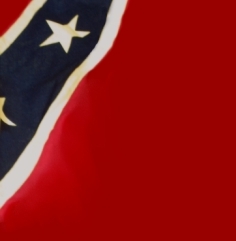 The same color scheme is used on the No. 9 mowers (1939) except the blue paint was eliminated from he outer wheels and the striping was discontinued. 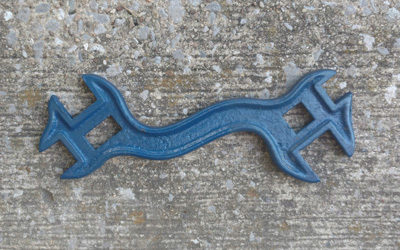 The cutter bar was also changed from blue enamel to blue lacquer. In June,1940 the seat spring, pawl holders, and eveners were painted blue, but later that same year the eveners were changed to Indian red. 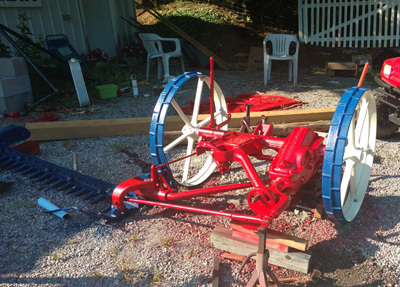 The Paint Committee has tried out various combinations of colors on different machines and has finally decided on a red, white, and blue program for the general line of farm machines, excluding motor trucks, tractors, engines, cream separators, wagons, and sleighs. As a general rule, Harvester red will be the dominating color and will be applied to the main parts of the machines. Harvester cream will be used on all ground wheels unless otherwise specified and on certain parts of some machines where the employment of this color will tend to lighten the appearance of the machine. The cost of painting the outside of the rims of mower wheels blue has amounted to a total of $2,117.40 on the manufacturing order of 98,000 mowers the past year. As there seems to be no special benefit in painting these wheel rims blue it has been decided to discontinue this and to dip the entire wheel in a cream color. Effective from the date of this decision McCormick Works will dip all mower wheels in cream and eliminate the blue color on the outside of the rim. 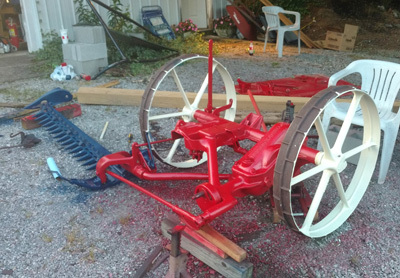 It is now the practice of the McCormick Works to paint mower bars in three different ways. The Lespedeza bar is blue lacquer, power-driven mower bars are dipped in clear varnish, and horse-driven mower bars are dipped in a blue enamel. 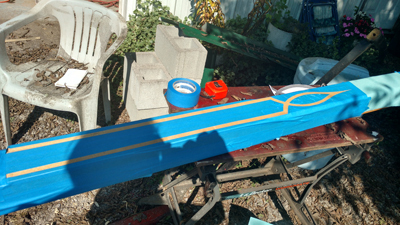 The suggestion comes from the McCormick Works that in the future they be permitted to paint all mower bars by dipping them in a blue lacquer. 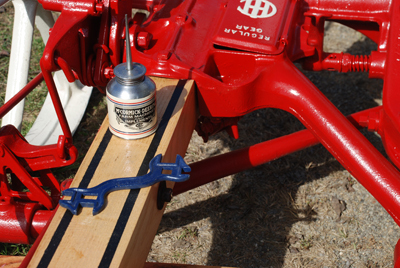 As this will result in a considerable saving in the manufacture of mowers, the Paint Committee authorizes the McCormick Works from this date to paint all mower bars by dipping into blue lacquer. 2. That the striping be left off from mower tongues and grass boards. The striping on the mower tongues consists of a decorative design in black. The same tongue when shipped out for repairs is not striped. The striping on grass boards consists of one dark red stripe along the top edge. If this striping is eliminated, a saving of $726.40 can be made on the annual manufacturing order. 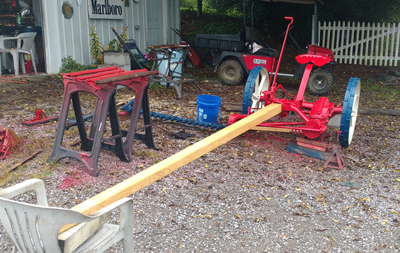 The Paint Committee hereby approves the use of red paint only on the A frame of ensilage cutters, the elimination of striping on mower tongues, grass boards, and on the gatherer boards of one-row and two-row vertical corn binders. 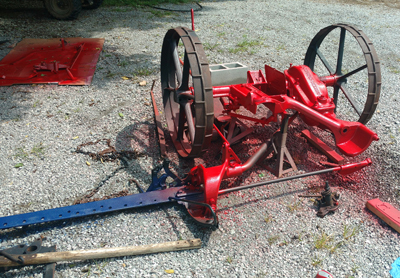 Harvester Red - Frame and all parts except wheels, pole, neckyoke, grass board, grass stick, cutter bar, seat spring, lifting spring, pitman, pawl holders, and eveners. 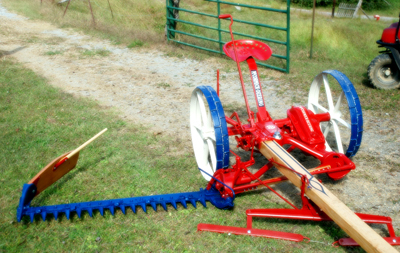 Harvester Blue - Seat spring, lifting spring, pawl holders, and eveners. 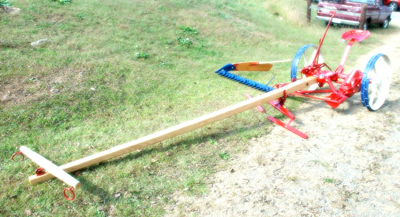 Harvester Ocher - Pole, neckyoke, grass board, and grass stick. 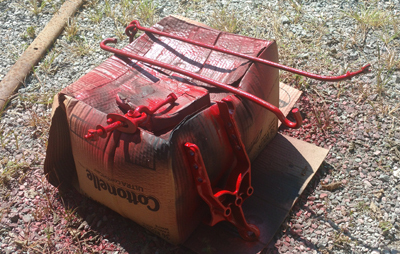 It is agreed that the frame and other parts painted in Harvester red will receive one coat only. 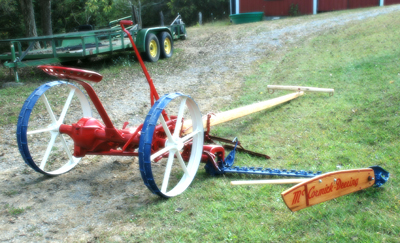 Harvester Red - Frame and all parts except wheels, pole, neckyoke, grass board, grass stick, cutter bar, seat spring, eveners, pitman, and pawl holders. 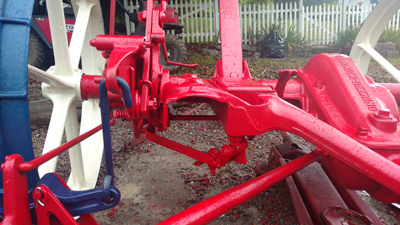 It is agreed that the frame and other parts painted in Harvester Red will receive one coat only. This cancels Paint Committee Decision No, 128 of June 21, 1940. I purchased this old machine from my neighbor 20 years ago. He was a man that had made his living on a farm his entire life and had never owned a tractor. His entire career was horse drawn, and as he went into his 90s he decided it was time to retire. Our machine had long since retired, and I had to cut a couple of cedars to free it from its resting place. I actually bought two of these from the farmer, and this one was in the worst condition. I bought another No. 7, one that the farmer had been using when he retired. This one is in working condition, though not very pretty. Notice the tires? No, this is not the model with pneumatic tires. In areas where there a lot of rocks, like here in Middle Tennessee, farmers would cut up old tires, fold them over the steel wheels, then lace them together. It wouldn't give you the ride real tires would offer, but it would offer a little smoother and quieter ride. Here I'm beginning to clean off the rust and apply an under coating. The machine will get a new front seal, new guards and ledger plates, knives, pitman, grass board, seat, and tongue. The pole or tongue lengths for these mowers are generally 14 foot in total length. With the mower setting low to the ground, the team needs forward room for clearance. Some have said that they use a 12-foot pole, and this is okay depending on the size of your team. Remember that the tongue sits 15 inches inside the cast iron mount. Plus, draft horses today are a lot larger than the teams our grandfathers used. Another consideration is the type of hardwood used for the tongue. Oak and ash are some traditional choices, but new ash is currently quarantined from being cut due to green beetle infestation and the tree is endangered. 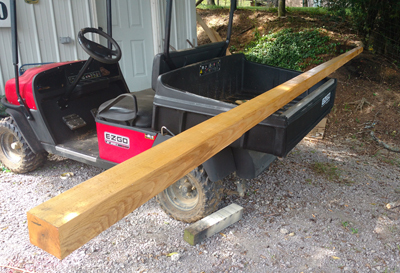 White oak is a strong wood that is weather resistant, but is very heavy. The No. 7 is already tongue heavy and trucks might be considered if you use oak to help relieve the neck weight from the horses. For my tongue I have chosen sassafras. Sassafras is very weather resistant, nearly as strong as oak, but best of all, it is light in weight. If you can find it available, it makes an excellent choice for the pole and grass board. 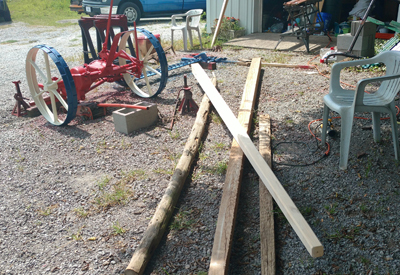 Here I have had a 16-foot straight-grained piece of sassafras cut from the sawmill, five inches square at one end and tapered down to three inches at the front end. Don't start the taper for maybe two or two and a half feet from the large end (remember, the tongue needs to be squared on the sides in the mount. The reason I have the tongue longer and wider than I need it, is because it is green. It will be stored in the hayloft of my barn to season. 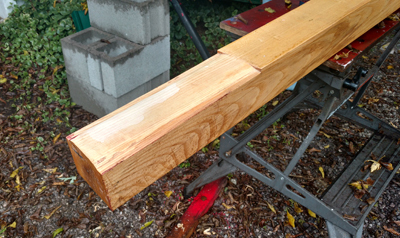 Wood will shrink in width as it dries. It will only shrink across the grain, not the length of the wood. It was cut a couple of feet extra in length to allow for any splitting that may occur as it dries. Once cured, I will trim the tongue to the appropriate size. While the mower is apart for paint, it's a good idea to change the front oil seal located behind the flywheel. After opening up the top cover, I found all the gears surprisingly in wonderful condition. There are no chipped teeth on the gears or signs of wear, however the front seal had seen better days. Removing the front seal is not complicated, but does take some finesse. First, remove the pitman and bearing from the flywheel, then inside the main gear case take a small piece of wood and wedge it between the two large gears to keep the mechanism from turning. Once this is done, take a hammer and another piece of wood (I used a scrap 2x2) and lightly tap the drive gear on the front shaft. DO NOT HIT METAL ON METAL! The gear will turn in the same direction that the flywheel turns when in operation. Do not try to force it as the teeth on the gear can break. Remove the wood wedge and turn the mechanism a little, then tap again on a different gear tooth. Patience is key. Repeat this process until the gear breaks free of the shaft. Once free, the gear will simply screw off the rest of the way. The procedure is the same for a No. 9 mower, however be aware that on this model there is a washer on the shaft located between the gear and housing. If you pull the shaft out without removing the washer, it will drop into the oil reservoir and will be very frustrating to try to retrieve. The oil seal is not a mysterious item that is no longer available. It's a simple oil seal that can be acquired at your local auto parts store. The number for the original seal will cross to two different oil seals, one large front to back and one skinny. The large one is the one that fits, though either will work. As with most antique mowers, the grass board is long gone. The tracker consists of a wooden paddle-shaped board, mounted to a metal side plate. The metal plate allows for a bolt and spring to attach the tracker to the cutter bar. The spring gives the board some play should it hit some obstacle. The underside of the tracker has a metal strip running the entire length of the board, and a small vertical metal support strip on the outer side. On the inside of the board is the tracker rod or grass stick. It is attached with a metal cover and two bolts. The rod pivots on one bolt, while the other enters one of three holes in the board, allowing it to be adjusted in height. 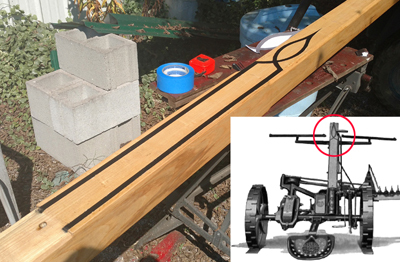 Ours is made of sassafras and will be painted with the correct logo and stripe. takes a long time to dry. Putting a few coats on. Like most machines made during the 1920s and 1930s, the No. 7 mower has a lot of square head bolts and nuts. There are some hexagon nuts on the machine, such as the guard nuts and the nuts on the wheel bolts, but the majority are the old style square bolts. Contrary to belief, you can still buy brand new square head bolts and nuts. Just because you can't find them at Lowes or Home Depot doesn't mean that they are no longer made. It just means that the big box stores don't sell enough of them to justify stocking them. water, and had to be cut off with a grinder. Luckily for restorers in this day and age we have a wonderful resource. If you're reading this, you already know of the strange and mysterious land known as the internet. Don't let the naysayers bring you down with the false claims that they do not make those anymore. 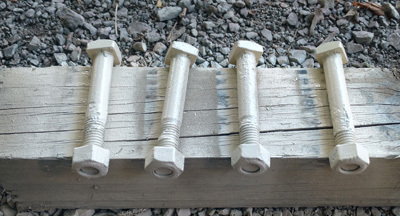 Simply Google "Square Head Bolt" and a plethora of bolt manufacturers and suppliers should magically appear. to work much better, so I replaced them with these hardened steel flange nuts. Another good resource for parts, even parts that are legitimately not made anymore, is Ebay. A broken lever, wheel, seat spring, etc ... can all be found on this site ... though patience is key. You might not find the part you need, right when you need it, but if you wait, and keep checking, mostly likely you'll see it pop up. When restoring anything, usually fixing it fast and fixing right have two different results. combination wrench that came with the No. 7 mower. 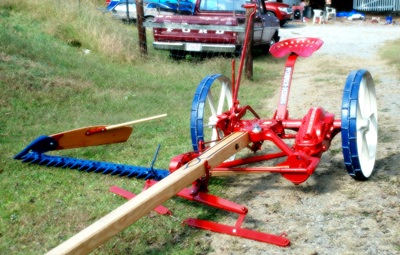 The pitman is a wooden arm that operates that mower. As the gears turn, they turn the flywheel on which the pitman is mounted. The pitman moves back and forth, moving the knives back and forth between the guards. Some have asked why the pitman is wood, and why it couldn't be made of metal? The wooden pitman is actually a safety feature. If the mower snags on a rock or other hard obstacle, the pitman is designed to break before metal gears or shafts can be damaged. Even so, the pitman needs to be made of a durable hardwood. White oak, hickory, and even hedge apple or bodock has been used for pitmans. Pitmans are usually available online for around $10 or so. In my case, I happened to have a scrap piece of white oak sitting around my shop that was practically the right size (I trimmed about 3 inches off). And size IS important. 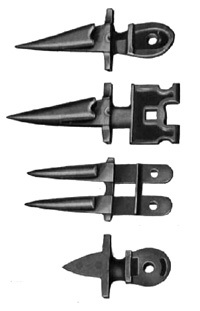 Different machines have different pitman lengths. IT MUST BE CUT TO THE EXACT SIZE. A pitman that is too long for your machine will be short-lived, and most likely will result in broken knives and bent parts. Always test your pitman before putting the machine in operation. 08-21-2017 -I painted the outer wheels today (while taking in the total solar eclipse). actually are. International White is actually more of a cream or almond color. to dry a few days before installing. Painting takes time. I had originally planned on using my sassafras tongue that I had cut at a local sawmill, but I ran across an ash tongue which I bought from an Amish gentleman. With the sassafras tongue still green and needing to season, I've decided to use it on my other No. 7 mower or maybe my No. 6. The ash pole is something that will be hard to find very soon. Ash is now quarantined due to a beetle infestation, and it looks like the species may go the way of the American chestnut. After some sanding and shaping, I'll put a coat of varnish on the tongue. A new mower would have had the tongue painted ochre, but replacements, like this one, usually came natural. Most farmers didn't repaint the tongues, though some, like my grandfather, may have coated the wood with old motor oil to help preserve it. I'm going to keep the natural wood look with a clear finish. 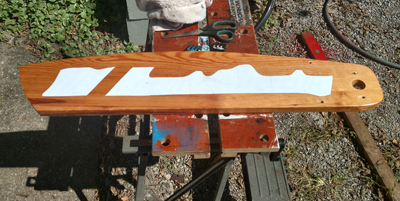 The tongue or pole with its first coat of varnish. Since Hurricane Harvey has moved over our house, I'm working inside today. So, I decided it would be a good time to restore the No. 7's oil can. This was a little bit of a complicated restoration. I found an original oil can, but the old paint was very faded and the logo was barely visible. First, I cleaned the can of all the old paint and years of oil residue, then buffed it with a very fine steel wool. Next, I painted the white field with a lacquer Harvester white paint. After drying a few days, I wet sanded the painted area with a 800 grit sandpaper, then applied the logo and stripes using a special transfer paper. I had found the logo online, but had to basically redraw it in Photoshop to get the resolution I needed for the transfer. On the back of the original can, the dealer's name was so degraded I couldn't read it anymore, so, I simply added the name of my own business to the can. I reversed the image, then printed it on the special paper using a laser printer. The application of the transfer is a little intricate, using a special adhesive, then heating with a heat gun, applying the graphic, then a series of rubbing the piece, heating, and washing with water. Afterwards, I applied a clear lacquer to help protect the logo. I think it turned out pretty good. 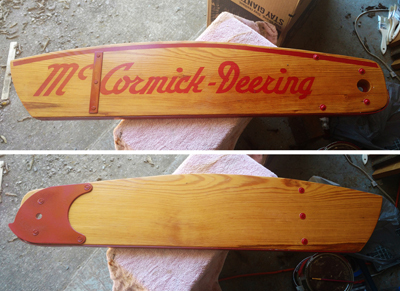 I applied the "McCormick-Deering" logo to the side of the grassboard using a water-based polyurethane. I had printed the logo in reverse on regular paper using a laser printer. I then applied a thin coat of poly to the grassboard. I then positioned the logo, face down, on the grassboard and carefully pushed out any wrinkles or bubbles. After letting the poly dry for a few hours, I then wet the paper with water. Once the paper was saturated, I carefully began rubbing the paper off of the board. It takes some effort, but eventually the paper comes off, leaving the ink still in the coat of polyurethane. I touched up any bad spots with a red marker, then applied another coat of poly to seal and protect the logo. I think it came out pretty decent. I'll add a red stripe along the top of the tracker after this dries. Starting to paint all the hardware on the tongue, which is supposed to be Indian red. No one sells a Harvester Indian red paint or has the paint code for the original paint, but as near as I can tell (from spots of original paint on some of the parts) Indian red is a bit darker than Harvester red. I found a paint that I think is pretty close. The No. 7 mower is really coming together now and it's time to start fitting the tongue or pole. Now, the No. 7 is designed to accept a square or round tongue, in fact, the tongue I took off this machine was a round cedar pole. Yes, I said cedar. Notice the domed recess where the tongue mounts. 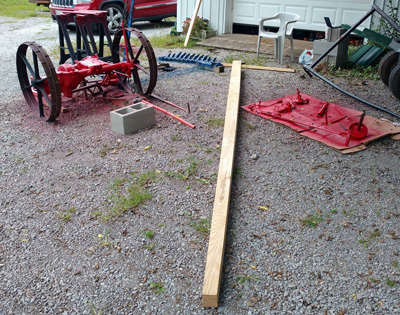 I know cedar is no where near the recommended strength for a mowing machine, but you have to remember that farmers, especially those that grew up in the Great Depression, used what they had available. The original pole had obviously broke and the farmer used the closest thing he had available. Cedar is a pioneer tree, meaning that if you scrape the ground clear, cedar is one of the first trees to reappear and start growing. The farmer probably had 1,000 of these straight growing trees to choose from. When his tongue broke, he simply cut a nearby cedar, trimmed the limbs and shaved the bark, and fitted it to the mower. It may not have been as nice and strong as a ready-made oak or ash tongue, but it worked for what he needed. And, if he was like my grandfather, who grew tobacco and raised beef cattle, he never grew money trees. You can fit either a square or round pole to the No. 7, but I obtained a nice square ash tongue from the Amish. The tongue was nearly ready to go, but with the rounded top to the recess where the tongue is mounted, I decided to try to make the pole fit a little better. Being a woodworker, I know that the tighter and more precise the fit, the stronger the joint will be. I want to get as much metal to wood surface area as I can. I decided to round the top of my pole to make a better fit. This is not necessary, but I think it makes it look nicer and makes it stronger. Another thing was the pole was a little too deep (top to bottom) to clear the adjustment rod that runs underneath, near the back. 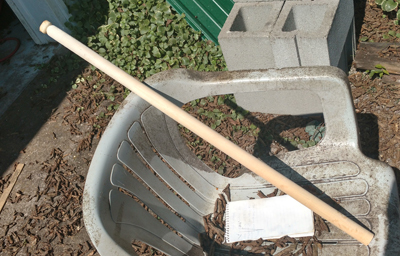 I want as much wood as possible, so I notched out a section of the pole, just enough to clear the rod. Once fitted and the holes are drilled, I'll put a coat of varnish on the bare wood to add some protection. I'll also add the black decorative striping to the top of the tongue before mounting it. The No. 7 had a black decorative stripes running along the top of the tongue just past the doubletrees. You can see the stripes in several illustrations in McCormick-Deering manuals and publications, but I have yet to find a photo of the stripes. This is my best interpretation of what they should be. With no fancy script or combination of colors, I used masking tape to mark off the area where the striping should be, then simply applied a few light coats of black spray paint. Light coats reduce the chance of bleeding. Afterwards, I applied a couple of coats of clear to seal the stripes. The stripes were on at least some late model No. 6 mowers, and all No. 7 mowers. The striping was eliminated in 1939 after the No. 9 models were introduced. I made the tracker stick using a piece of oak on a lathe. I tapered the stick slightly and rounded the end. Unfortunately I don't have any original parts to go by, and I had to make the metal mounting bracket from scratch. The bracket wraps around the stick and has two holes for mounting to the board. The stick pivots on the back bolt, while the pointed end enters one of three holes, allowing for the stick to be adjusted in height. I cut out the bracket from a thick piece of sheet metal, then, using a hammer, rounded the metal around the stick. The pointed end sits flat against the board, so after rounding it, I put it in a vice to flatten the end. After drilling the holes, I'll prime and paint this piece red. The grassboard is almost finished. I didn't have an original grassboard to go by and had to rely on old photos and illustrations to make this one, basically from scratch. I fabricated pretty much all the metal and cut out the sassafras wood. One thing I did have was an original John Deere grassboard. I used it to get the general dimensions and the angle for the grass stick. There is also a thick metal band running along the bottom of the board, to help reduce wear. The board attaches with a bolt and a spring at the end of the mower bar. The spring allows the board to flex should it hit some kind of obstacle. 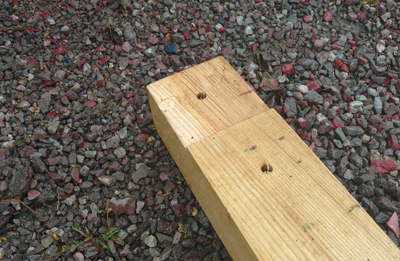 Here's the finished grassboard with the grass stick attached with carriage bolts and square nuts. I think it turned out pretty good. I'll add the spring and attach it to the mower bar. With the grassboard finished, I turned my attention to the evener. The evener, or yoke, is the wooden bar mounted on the front end of the tongue. McCormick-Deering's literature refers to this bar as the evener, but later calls it the yoke. The middle bar of the double tree is also called an evener by some, so, as not to confuse the two, I'll refer to the front evener as the yoke, and the middle bar on the double tree as the evener. 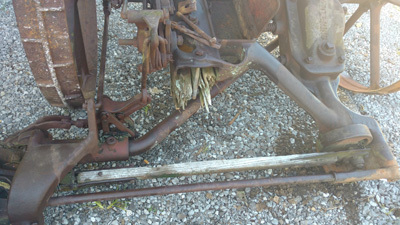 I have the original yoke for the machine, but like so much else on the mower, it had seen better days. 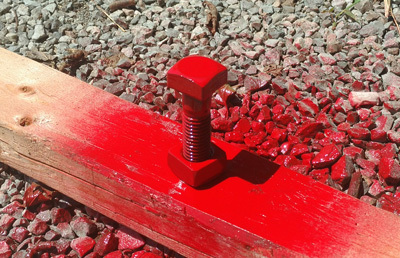 The yoke had seen many hours of use with the wood worn around the ends, and the metal rings and eye bolts worn thin. I could have restored the original, but I decided to just make a new one. Luckily, last winter, I had a white oak tree fall on my property. This gave me a good source for a piece of wood that would need to be three inches thick. After finding a nice, straight branch, I cut it and stripped off the bark. I was going to have to turn the yoke on a lathe, but the piece I needed was about four inches longer than what my lathe could hold. Fortunately, I had a solution. I found my wood lathe at an auction for $5, and I figured the price was so low, I actually bought two. The reason I wanted two lathes is just for this type of problem. When turning bed posts, and high-back chairs, I would need a long lathe so I wouldn't have to turn them in two pieces. I tore the cheap lathes apart and found that the reason neither worked was that whoever owned them before had never bothered to lube them. After oiling them up, and some gentle persuasion, both worked perfectly. 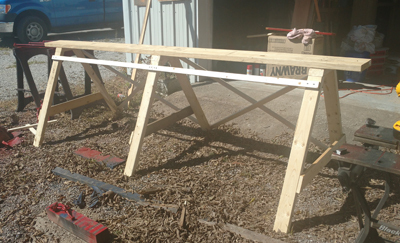 I built a A-frame bench long enough for both lathes, then simply bolted them on, end to end. This gave me a long lathe track, allowing me to turn long pieces. A little time on the band saw, and with a draw knife, helped me balance out the log. Then, I mounted it onto the lathe. 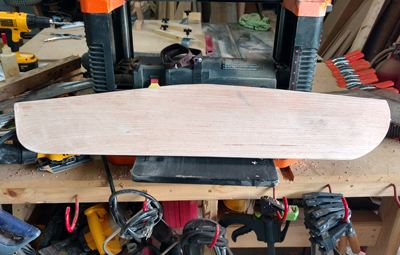 I rounded the wood at three inches, then worked from the middle to taper it at both ends. The yoke needs to be the same length as the double tree evener, with the metal rings on the yoke lining up with the bolts on the evener. I discovered that finding three or four inch steel rings is actually pretty hard. The biggest rings that most tractor or farm supply stores have is two inches, way too small for my needs. Once again, the Internet came to the rescue. I found a source for non welded three and a half inch steel rings online. I need them to not be welded so I can install them onto the new eye bolts. Once installed, I weld them together myself. There is really no other way to do this, except for with a very small brush, and a steady hand. Yes, the raised lettering on the mower body was highlighted in International white. It's not as hard as it might look, but it takes a long time to do it right. After I did this, I sprayed the whole body with a clear coat for extra protection. Well, here it is! If you ever wondered what a McComick-Deering No. 7 Mower looked like when it was brand new, here it is. So many today only see these as lawn ornaments or mailbox mounts. This mower is complete with its correct wrench, oil can, decal, lettering, and the correct Red, White, and Blue color scheme. The tongue is ash, while the yoke and pitman are made from white oak. The grassboard is sassafras. The only thing that would not be considered accurate is that the tongue and yoke are natural with a varnish. Originals would have been painted ochre, which is a yellow-orange color. Most replacement parts wouldn't have been painted, and I think the natural looks better.